Woo-hoo! Thanks for writing it up. You take flights round the globe until your cashcard ends up at exactly 0$, then it automatically vanishes. I didn’t test if it really disappears but this could explain it. You lose all items when you get arrested after usage of i.e. the blue crystal. Yet, Annie can help you reach the airport by paying for you. Once she leaves, you’re stuck there without any cashcard. 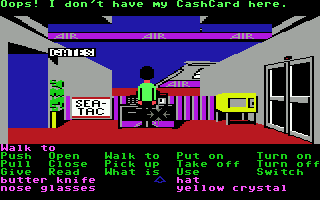 The game engine very well handles the case of 0$ cash, btw. You do not lose the CashCard when captured. Also, you can not leave it at home, destroy it in the kitchen sink or sell it. Mnx orvat va FRN-GNP vf cebonoyl qhr gb hfntr bs gur lryybj pelfgny – gung nvecbeg vf gur PnfuPneq ernqre arkg gb gur gryrcbegf. Guvf vzcyvrf gung vg trgf ybfg yngre va gur tnzr, naq vg pna unccra nyy bire gur jbeyq. The only way I know for Zak to lose his belongings is in Katmandu jail. The only way I know for Zak to be arrested is by stealing the flagpole before burning the hay. I dunno if this could happen, but, can Annie speak with the Doc in Kinshasa, instead of Zak? If yes, will Zak automatically ‘learn’ the usage of the yellow crystal? If this is true, my idea – not yet tested – is quite difficult and probably incorrect since you must get loads of money for Annie’s tickets. 1) Zak goes to jail in Katmandu for stealing the flagpole without first burning the hay. All his belongings will be took by the policeman. 2) Annie flies to Katmandu, burns the hay and takes the flagpole. Enters the jail and takes Zak’s belongings. 3) Annie flies to London, casting the spell on the shards. 4) Annie goes to Katmandu, then to Kinshasa, to speak with the Doc and to learn about the yellow crystal’s powers. 5) Annie flies back to Katmandu, burns the hay again, frees Zak and gives him the yellow crystal, but not his Cashcard. 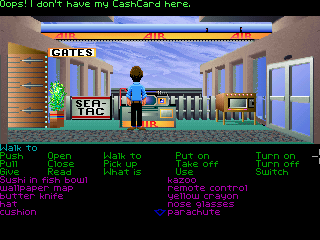 6) Zak uses the crystal to teleport himself to Seattle and then just walks to the airport. Things went differently but I solved it! 1) Buy expensive tickets for Annie, with Zak, then let her refund them at the terminal. 2) When you collect about 8000$ let Zak and Annie go to Katmandu. 4) Burn the hay with Annie, then go to free Zak. 8) While hay burns, take Zak to Kinshasa so he could learn the usage of the yellow crystal. 9) Fly quickly to Katmandu again, give the yellow crystal to Annie and wait until you and up in jail again. 10) For the last time, let Annie burn the hay and then free Zak from jail, take his belongings from the cabinet and give him the yellow crystal and the wallpaper map. 11) Let Zak use the yellow crystal to teleport in Seattle squirrel cave and then walk the airport. Yeah, that’s pretty much it, except Zak only needs to go to Jail twice: the first time so the policeman will capture you again *after* you have stolen the flagpole (which melts to the stone in Stonehenge), the second time to lose your stuff. Is there another way to end up in jail that has nothing to do with the flagpole? Because, when Zak steals the flagpole he automatically lose his belongings, doesn’t he? And, since you need Zak to steal the flagpole, since Annie won’t do it, he must be freed at least once. Maybe it’s only a matter of quickness? Be quick to melt the crystal and then fly back to Katmandu to give Zak the CashCard and the Crystal; let him go to Kinshasa, and then come back to be ‘caught’ again by the policeman who was, meanwhile, still dealing with the fire? It’s quickness, but in the very first ‘phase’. Place Annie next to Zak when he steals the flagpole and just “Give flagpole to Annie” so that the guard won’t search her. Zak only loses his stuff when he is caught; after the hay has been set on fire (and Annie let him out of jail), he can take the flagpole, repair and learn about the yellow crystal, and when he goes back to Katmandu and enters the jail, he is captured again. By the way, as I tried just few hours ago, I figured out that you can avoid step 3 by simply placing Annie next to Zak when he first tries to steal the flagpole. Instead of using the verb “Pick up” use “Give” so the full action is “Give flagpole to Annie”; when the Policeman exits the jail, he says: “Where’s the flag?” and puts Zak in jail without searching on Annie.